Mount Prospect, IL - May 14, 2013 - GAM Gear, a manufacturer of precision gear reducers, servo couplings, and linear mounting products announces the release of the 2013 GAM catalog. For the first time ever, all of GAM’s product groups can be found in a single 102 page comprehensive catalog. An easy to use product selection guide helps users find the right product based on technical specification, configuration, or feature. New product additions to catalog include the EPL-A which is an inline planetary gear reducer that has popular metric output dimensions and the EPL-F which has a compact flange output. A new coupling offering is the EDC which is a low cost elastomer drive shaft. The catalog also includes information on the PMK (Parallel Mount Kit) which is the latest addition to GAM’s linear mount product line. The PMK is a custom designed mounting solution enabling virtually any motor or gearbox to be connected parallel to any linear ball screw product. Other new sections incorporated include GAM’s complete line of spiral bevel gearboxes (V-Series), mini spiral bevel gearboxes (L-Series), and GAM’s highest performing inline planetary gear reducer (SPH Series) which features helical gear technology. 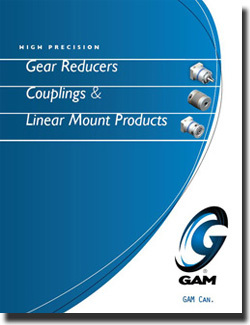 All of GAM’s products are shown in the new catalog, however full information on certain couplings is only available online at http://catalog.gamweb.com/catalog3/d/gam. The online catalog is fully interactive with over 16,000 products that can be configured to user specifications and then quickly downloaded in popular 2D / 3D CAD formats. PDF versions of the 2013 GAM catalog are also available at http://www.gamweb.com/literature.html.